Open any newspaper and all you see is strife, conflict and humans making life hell for other humans. Doesn’t the question ‘Why is this happening?’ creep into your mind on seeing this? Many people question the cause of all these problems but don’t really look for the answers. 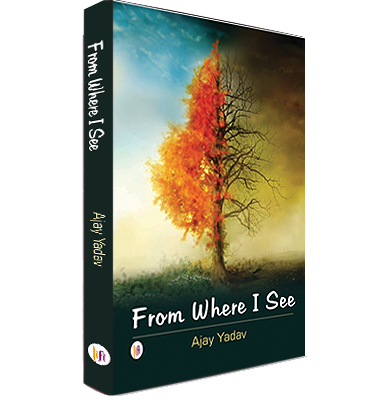 In his book ‘From Where I See’, author Dr. Ajay Yadav tries to delve beneath the surface and find answers to these situations that stem from the beliefs of men. Dr. Ajay Yadav is a consultant anesthetist, intensivist and pain specialist. His textbook of anesthesia is the most sold textbook for medical undergraduates in India, Southeast Asia and Africa. He is a rational, logical and analytical thinker and is fond of reading, travelling and long distance running. It had always been his dream to write a book which can unfurl the other side of curtain. Ajay meets his childhood friend Shruti on a social network site. He finds her to be struggling with intrapersonal, interpersonal, inter-social and inter-religious conflicts. Eventually the conflicts kill her. Even if the police solve the case, will it prevent hundreds of Shrutis from getting killed? How long will we think of ‘who’ killed as more important than ‘what’ killed a person? Till we don’t address this issue and work on it, many Shrutis will keep on getting killed. We need to cure the disease, not just the symptoms. This book is an effort by the author to find the root cause and probable remedies of conflicts, and tries to explore hundreds of pertinent questions like “Why does it become so easy to get volunteers to blow up themselves and others for the sake of religion? Does religion divide or unite? What precipitates extramarital affairs? Is the immature and wrong interpretation of female emancipation the reason for a 13 fold rise in divorce rates in the last 5 years? It’s not only a book, it’s the path to revolution, a journey towards an utopian world. Accepting the truth is the toughest job in the world. If you feel that you are open minded, have the courage to accept the truth and a desire to change the world. Be a part of the change and take the first step to build a road to the ideal world. This is one of the nice books that I have read in recent times because it raises a lot of questions in the mind of reader. And along with that it also gives a very good solutions for them. The main highlight of this book is the concept of Uthopian World. I will give 5 stars for the concept of Uthopian word and recommend this book to those readers who like to read about the utopian world. However in some parts the book are very lengthy and the reader tends to become bore. The author could have cut down somewhere and made it more crisp.